As seen from parallel U.S. 5, this deck truss bridge carries Interstate 91 over the Williams River near Rockingham, Vermont. Photo taken 08/04/07. Interstate 91 provides a backbone route for western New England. Southward throughout Connecticut and a good portion of Massachusetts, Interstate 91 serves more populated areas and old industrial cities, including New Haven, Hartford and Springfield. North of there, it parallels the Connecticut River along the picturesque border of Vermont as it nears the “La Belle Province” of Québec. Interstate 91 in Connecticut is part of High Priority Corridor 66: Interstate 91 Connecticut. Interstate 91 primarily bypasses communities along U.S. 5 in Connecticut, Massachusetts and Vermont. 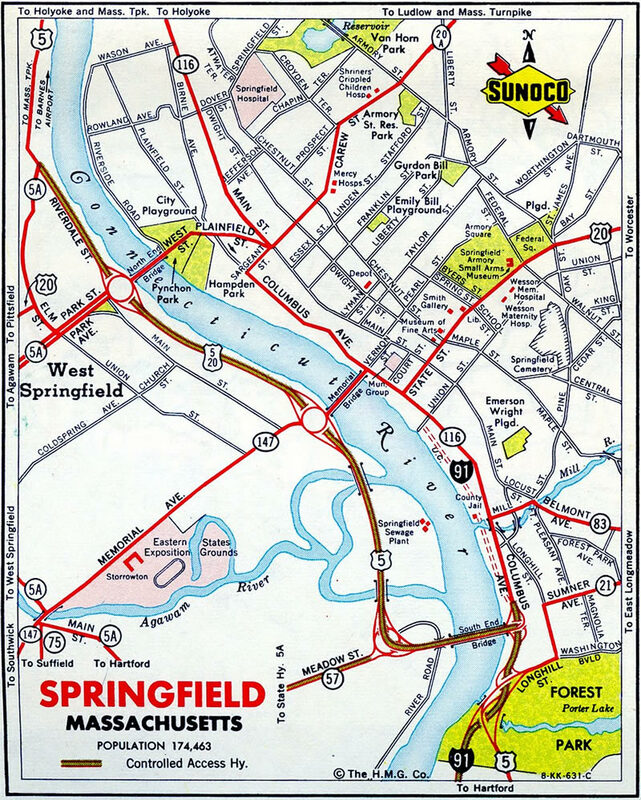 I-91 also overlaps with U.S. 20 briefly through Springfield. Interstate 91 from the Massachusetts State line north to Brattleboro in Vermont opened to traffic on November 1, 1958.1 This was the first route with controlled access to open in Vermont. 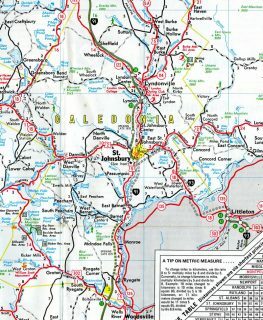 Northeast Kingdom of Vermont – 1978 Vermont Official Highway Map. The final stretch of Interstate 91 opened in the Green Mountain State was located near St. Johnsbury. I-93 was completed west to I-91 in 1982. Looking north from the Caswell Avenue over crossing at the Interstate 91 Port of Entry for the Canadian border. Quebec Autoroute 55 continues the freeway north 33 miles to Sherbrooke. Connections with Quebec Autoroute 10 lead travelers west to Montreal. Vidcap by Dave Watts (1999). The freeway continues northward through Stanstead Plain in southern Quebec beyond the Customs Booths at the International Border. Interstate 91 and 87 directly tie into the Quebec Autoroute system. Interstate 89 becomes Provincial Route 133. Vidcap by Dave Watts (1999). Interstate 91 enters downtown New Haven from alongside U.S. 5 (State Street). A trumpet interchange joins the two highways at Exit 3. From there the freeway turns southward on the final approach to Interstate 95. Ramps for Hamilton Street (Exit 2) and Connecticut 34 (Richard C. Lee Connector) depart in advance of the Mixmaster Interchange with the Connecticut Turnpike. Photo taken 06/26/05. Traffic congestion from Interstate 95 southbound bleeds onto Interstate 91 southbound ahead of the Mixmaster Interchange. To address issues with this failing interchange, ConnDOT is reconstructing a 7.2-mile long section of Interstate 95 complete with the new Pearl Harbor Memorial Bridge nearby. The reconfigured interchange will better handle movements between the two freeways when completed. See www.i95newhaven.com for details of the project. Photo taken 06/26/05. A single-lane off-ramp carries motorists onto Interstate 95 northbound across the Quinnipiac River into East Haven. Interstate 95 travels east-west along the Connecticut coastal region between Bridgeport and New London through the New Haven vicinity. Connecticut 34 spurs west from Exit 1 into downtown New Haven. Photo taken 06/26/05. A large diagrammatic overhead lies at the Howard Avenue over pass for the upcoming junction with Connecticut 34 west (Exit 47) and Interstate 91 north (Exit 48) on Interstate 95 north. Connecticut 34 stems west into downtown New Haven from the Connecticut Turnpike while Interstate 91 provides the main route to Hamden, Wallingford, Meriden, and Hartford. Photo taken 08/09/04. Interstate 95 northbound draws closer to the Central Business District of New Haven at the Exit 46 off-ramp onto adjacent Long Warf Road. Use Long Warf Road northbound for U.S. 1 (Water Street) south to State Street (former U.S. 5) and downtown. The northbound beginning of Interstate 91 departs from the left-hand side of Interstate 95 northbound in 0.75 miles. Photo taken 08/09/04. Exit 47 leaves Interstate 95 northbound for the westbound beginning of Connecticut 34 (Richard C. Lee Connector). The freeway for Connecticut 34 ends prematurely ahead of York Street in downtown New Haven. Traffic merges onto a pair of frontage roads along a wide right-of-way intended for a never built westward extension of the Connector to Derby Avenue and Connecticut 122 (Forest Road) in West Haven. Connecticut 34 otherwise travels 24.37 miles miles between New Haven and Newtown. Photo taken 08/09/04. Interstate 91 ties into the Mixmaster Interchange at Interstate 95 just north of Connecticut 34 (Exit 47). Exit 48 carries traffic onto Interstate 91 from the left-hand lanes of Interstate 95 north as the Connecticut Turnpike turns east to cross the Mill River en route to East Haven. Interstate 91 parallels the U.S. 5 corridor north to the capital city of Hartford, Springfield, Massachusetts, and Brattleboro, Vermont. Construction is scheduled between 2007-2012 involving a revision of the entire Mixmaster Interchange. At stake is the elimination of the left-hand ramps and widening of the Connecticut Turnpike to improve the traffic flow through the area. See www.i95newhaven.com for details of the project. Photo taken 08/09/04. Celebrating the 50th Anniversary of the Eisenhower Interstate Highway System: Previous Interstate Facts of the Day by the Federal Highway Administration (FHWA). 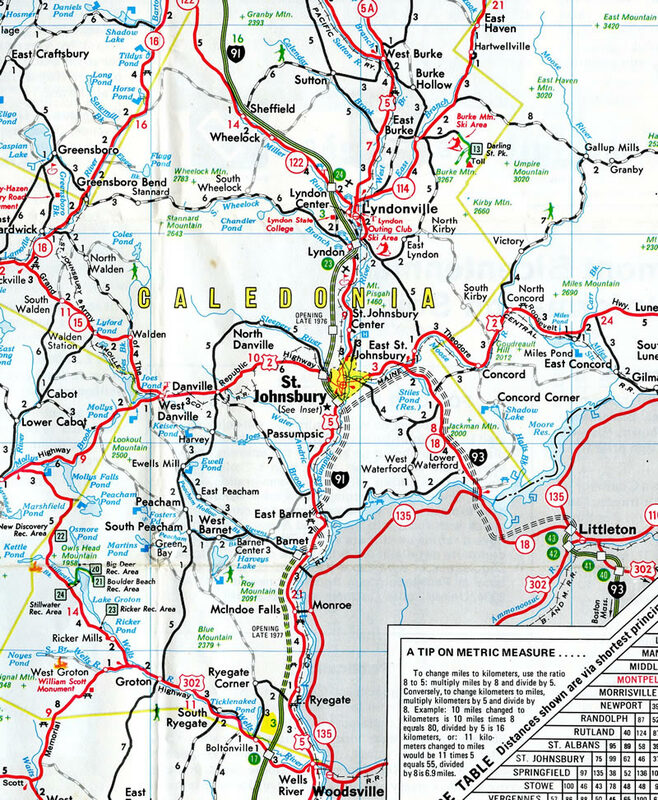 Outline History of Vermont State Highways – National Highway Week, September 19-25, 1965. Prepared for informational purposes only by the Vermont Department of Highways. Vermont’s 14-Year Planning Program on the Federal Aid Highway System by the Vermont Department of Highways (April 1963). “Next up: Reconstructing the Route 34, I-91 interchange (video, animation).” New Haven Register, April 25, 2010. “New Haven Interstate 95-91 interchange to head in new direction for first time in 60 years.” New Haven Register, July 10, 2016. Page updated July 14, 2016.